In other words, it consists of measures of central tendency, variability, skewness and kurtosis. Measures of central tendency are used to find the single value that best describes about the entire distribution. There are three main measures of central tendency: Mean, Median and Mode. Measures of Variability refers to the spread or dispersion of scores. There are four main measures of variability: Range, Inter quartile range, Standard deviation and Variance. Degree to which scores in a distribution are spread out. Example 2: Suppose you are asked to provide a figure that best describes the annual salary offered to students in ABC College you would answer this question with a measure of central tendency and variability. 3. In the Input Range we select the data, and then select Output Range where you want the output to be stored. 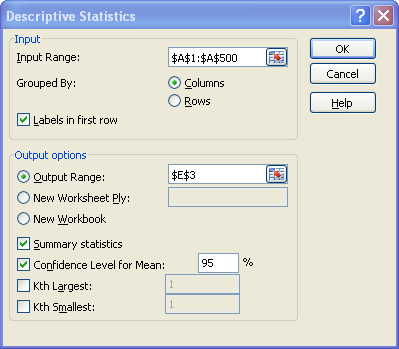 If you don’t specify the output range it will throw output in the new worksheet. 4. Check Summary Statistics and Confidence Level for Mean options. By default the confidence level is 95%. You can change the level as per the hypothesis standard of study. 5. When you click Ok, you will see the result in the selected output range. The average value is 5.533. The middle value is 6 and the most frequent value is 8. Negative skewness indicates a left skewed data. Negative kurtosis indicates a flat distribution. The 95% confidence level indicates you can be 95% sure that the true percentage of the population lies between 5.275 (5.533 – 0.258) and 5.791 (5.533 + 0.258). 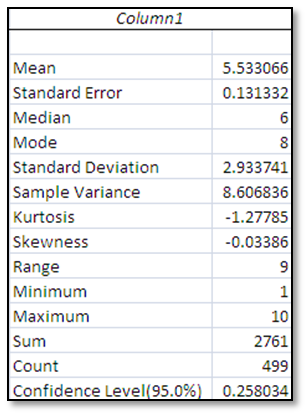 2 Responses to "Descriptive Statistics Using Excel"
Negative kurtosis indicates a flat distribution. Negative kurtosis indicates a distribution with less rare, extreme values than a normal distribution.